Swiss-Belsuites Pounamu believe in protecting the beautiful environment of Queenstown and New Zealand. We are committed to reducing adverse effects on the environment by introducing initiatives that have a positive impact. 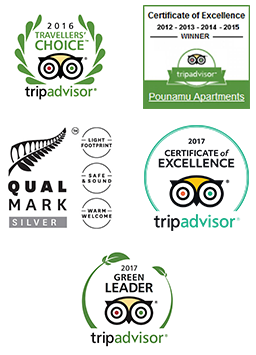 Gaining the “Qualmark Silver Award” in 2010 Swiss-Belsuites Pounamu have proven effectiveness in energy efficiency, waste management and water conservation. Our luxury accommodation reflects this philosophy. Our sustainability commitment is an ongoing journey. The Apartments have double glazing throughout, retaining heat and reducing the consumption of electricity to heat the Apartments. Air Conditioning (Mitsubishi Electric Air) units. Each Apartment and Studio Room has a manual touch-pad, to allow Guests to adjust room air conditioning to their individual requirements and to assist in reducing energy consumption. We use Eco Pal 100% "Oxo-biodegradable" plastic bags that degrade and disappear in a short timescale, leaving no fragments, no methane and no harmful residues. We only use 100% biodegradable or non-toxic cleaning products, kitchen and laundry detergents. Wherever possible we purchase products in bulk i.e. cleaning products, and use pump bottles for cleaning reducing the need of plastic containers. We use Pacific Green 100% recycled toilet tissue (the first range in NZ to be listed in the Ministry of Environment’s Govt3 paper Buyers Guide). We have reduced water and detergent waste by servicing our Apartments at end of stay (unless at guests request at an additional charge). Our toilets automatically half flush: a second flush can be used when required. Our Ensuite amenities we use are the “Koha Spa” range, which is 100% biodegradable formulations enriched with Harakeke (flax) oil and Manuka Honey. Our toiletry soap is from the “Koha Spa” range which is 100% pure vegetable based. We use Organic tea and coffee. We source our products from local or Fair Trade producers wherever possible. To use low energy light bulbs where practical. We have set our hot water temperature at 65 degrees. The under-floor heating pumps have been rewired to be controlled by the thermostats which are set to 23 degrees max. We have reduced surplus lighting around the complex and removed unnecessary light bulbs to reduce energy wastage. We purchase power and gas in bulk to reduce costs for our owners. We encourage our Team and Guests to recycle their rubbish, using the recycle bins located between blocks 1 and 2 and in Block 3 (at the top of the driveway). We encourage our Team and Guests to always turn off lights and equipment when not in use. Our Apartments are well insulated and double glazed to maintain and hold temperature and to reduce noise pollution. Investigation of additional hot water pipe insulation from the boilers to the Apartments. We hope that you leave Swiss-Belsuites Pounamu knowing that your actions and support helps us to maintain and enhance our beautiful region and country, New Zealand.